A masterfully designed hardcover collecting over 200 pages of art and commentary from the creators of the brutal and thrilling Days Gone! Set in the beautiful and rugged landscape of the Pacific Northwest high desert, a global pandemic has wreaked havoc on everyone and everything in sight. Now, former outlaw biker turned bounty hunter Deacon St. John must fight for survival against all odds. 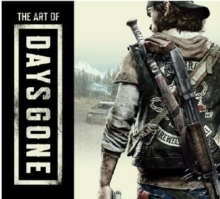 Witness the creation of Deacon's epic adventure with The Art of Days Gone! From Dark Horse Books and Bend Studio (Syphon Filter, Resistance: Retribution, Uncharted: Golden Abyss), The Art of Days Gone takes an unflinching look at the lovingly detailed production of this hugely anticipated game, featuring hundreds of pieces of concept art and exclusive commentary directly from the team who created it!